Are you looking for an epic adventure of a lifetime? With views that will blow your mind? Get ready to lace up those hiking boots for 35 of the best day hikes in the world. You see, I’ve always been a dreamer. More often than not, a dreamer without a plan (but that’s where my husband swoops in and saves the day). Right now, one of my dreams without a plan is to hike trails all over the world. Not going on more hikes with my husband and boys is one of my biggest regrets from our 17 months on the road. I was either working. Or too tired. Or didn’t think I was in good enough shape to tackle the trails they were experiencing. But the ones I did go on, even if they were hard, the feeling you get after having accomplished something that seems a little outside of your realm of possibility, is incredible. So in an effort to put a plan to my dream of going on some amazing day hikes all around the world, I asked fellow travel bloggers to share the best day hike in the world they’ve ever been on. And let me tell you, I am so excited to share these with you! Get ready to start dreaming with me my friends because these hiking trails are nothing short of amazing. Cape Verde is an African country which contains several islands. Some of the islands are perfect for beach vacations with paradise-perfect beaches. But if you are looking for a destination in which you can be a bit more active, you should try the beautiful Santo Antão. The island lies next to São Vicente, which you can reach by plane. 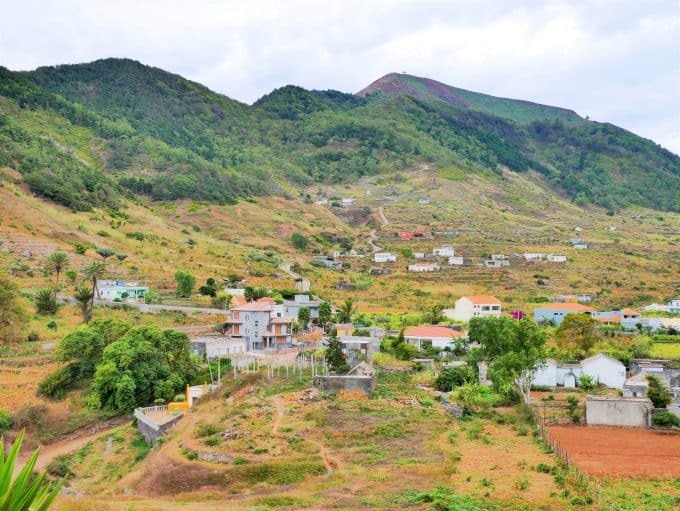 On Santo Antão you can do several hikes. One of the most popular and most beautiful is the hike down into the valley of Pául. You ascend in the crater and have wonderful views over the valley. It might be a bit cloudy at the top, but I promise it is worth the views when it gets clearer. While going down, you pass several plantations growing bananas or making the famous drink you can buy all over Cape Verde: grogue. It is tiring for the legs, so wear hiking shoes and be prepared for sore muscles. I loved this hike a lot: it was our first day on the island, so we fell in love with it after seeing all of nature. The hike will take you about 5 hours from the top until you are all the way down the valley. Not tired enough after this amazing hike? Try another one! What about the beautiful coastal walk? It is 16 kilometers and shows you cliffs and cute villages along the way. Or go a bit more inland and hike along the plantations on the islands which grow many different fruits. 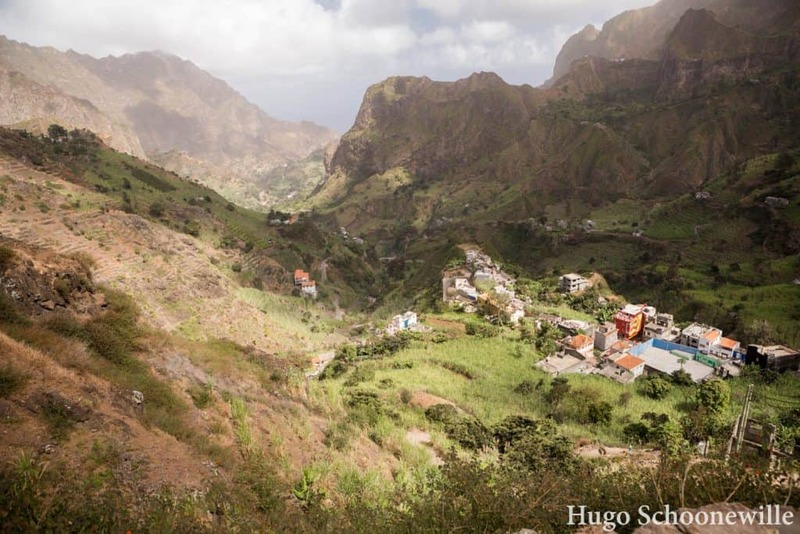 I promise no day will be the same on Santo Antão and you will want to do a new hike every day. São Nicolau was the second island I visited in Cabo Verde. Cabo Verde is an archipelagic country in the Atlantic Ocean, consisting of 10 islands. The first island I visited, Sal, is quite flat and dry, but São Nicolau is very mountainous and slightly greener. Monte Gordo is the highest peak of São Nicolau (1312m) and of volcanic origin. Its flora and fauna are protected in the Parque Natural Monte Gordo. The hike to the peak starts from a little village called Cachaço, from where the climb is only 600 meters. At first, the trail led us between people’s farms at the foothills. The trail got skinnier and skinnier the higher we went. Eventually, we got to this flat area that’s completely forested with interesting shrubs and trees we’d never seen before, some of which are medicinal in use. It smells so good. The last bit to the top was a bit steeper, and the trail turns into some loose kind of material. The trees disappear once again near the top. It’s windy as heck, but the views are so worth it. At the top, there are some structures to provide the island with mobile coverage and protect us from the wind while snacking our lunch. There’s a 360° view of the entire island, and some neighboring islands like Santa Luzia and São Vicente. We did the 7-kilometer return trip in 3.5 hours, also taking a nice long break at the peak. It’s not a very difficult or long hike, but not many people do it. Of all the spectacular hikes I’ve done in Cabo Verde, this is definitely the most rewarding one. The full loop hike to Refugio Frey is one of the best day hikes that I have completed in my lifetime. It is an extremely diverse and somewhat challenging eight-hour hike that is located in the Nahuel Huapi National Park in the Patagonian town of Bariloche, Argentina. During this life-changing hike, you will find yourself bouldering across cliff faces, descending steep and loose scree, looking out over burnt orange mountain tops, basking in the views of glacial lakes, and wandering through quaint forests. There is ample opportunity for personal reflection, physical challenge, and photography during your hike to Refugio Frey. You won’t be disappointed. There are quite a few different ways to complete this hike. The most common way is the “Normal Route” which takes you up and back on the same forest path to Refugio Frey and the lake. While this is still beautiful, you will miss out on some of the most spectacular views and challenging terrain that is located over the pass. I would only recommend completing this return hike if you would prefer an easier option that has no bouldering or descents on loose scree. 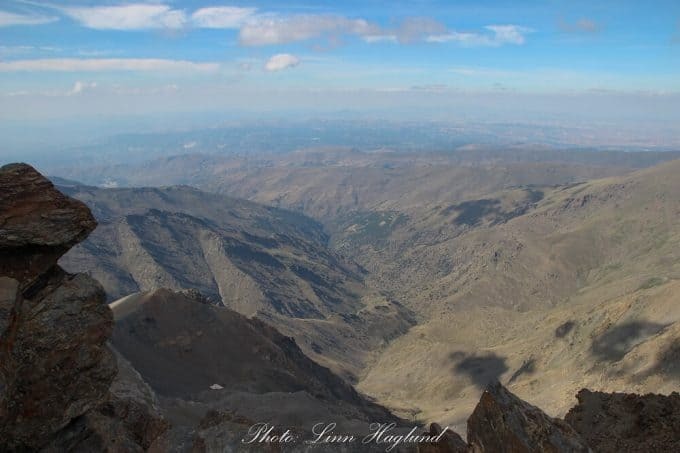 If you would prefer to complete a loop and see some of the amazing mountain landscapes and rock formations that the Argentinian mountain, Cerro Catedral has to offer then you should complete the full circuit instead. This guide on the Best Hikes in Bariloche will show you how to complete the full circuit and provide you with all of the information you need to get there and away, to complete the hike, and to enjoy it while you are there. 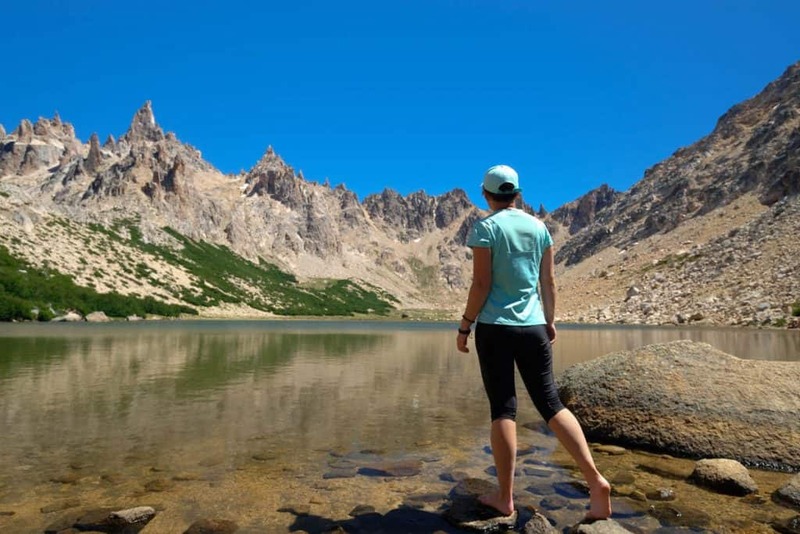 The hike to Laguna de Los Tres, in Patagonia (Argentina), goes to the base of Mount Fitz Roy. It is – by a long shot – the most epic day hike one can ever go on. The trail is 24 km long – whether you start from El Chalten and return to the village, or start in Hostaria El Pilar and finish in the village. It is a medium difficulty hike, where the most difficult bit is the 1 km with 40% incline that, shortly after Campamento Poincenot camping site, goes all the way up to the lagoon. You will have to go back down on the same trail, and it takes around one hour to go up and about the same amount of time to head back down. A sign at the beginning of the uphill trail warns hiker about the difficulty of the trek, and suggest that only the most fit should continue. If you are among those, you are in for a real treat, as the views of Laguna de Los Tres and of Mount Fitz Roy are simply stunning. Other highlights along the trail are the Mirador Piedras Blancas, from where you’ll get a first peak of the Fitz Roy; Chorrillo del Salto waterfall, which you can reach via a short detour at km 5 of the hike – there is no sign pointing to the waterfall, but it is easy to get there if you just follow the roar of the water. 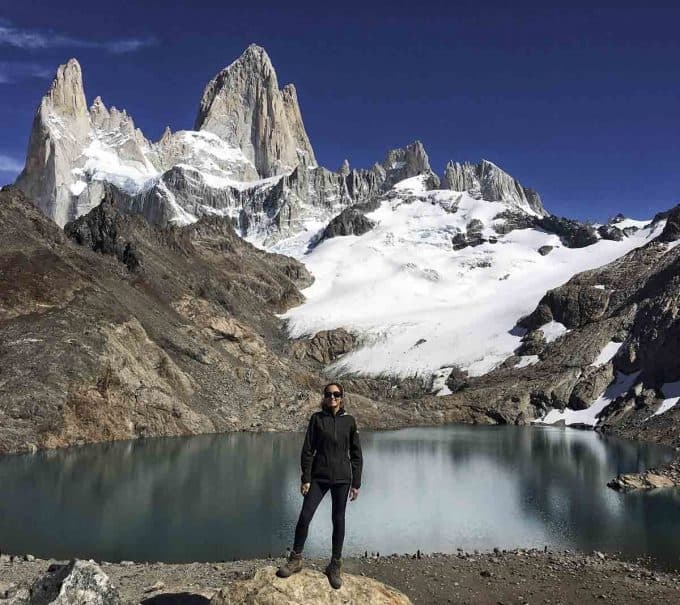 If you plan to hike Laguna de Los Tres, my advice is to plan to spend a few days in El Chalten and to wait for the perfect weather conditions or else the visibility once at the top will be limited and the views obstructed. Needless to say, the best time of year to hike this trail is the summer (which goes from November to the end of March), and considering this is Patagonia, the weather is rather unpredictable even in the best season! Tasmania is a top destination for hiking with a pristine environment that makes it to a wonderland. There are many walking trails in Tasmania that you can do on a day hike or a multi-day adventure. Among all, my favourite hike is the Hazards Beach Circuit in the Freycinet National Park on the Eastern coast of Tasmania. This is quite a long hike that takes 5 to 6 hours. Although it is only 12 km long, the terrain changes a lot and sometimes it’s a bit strenuous to walk in the sun, up and downhill. 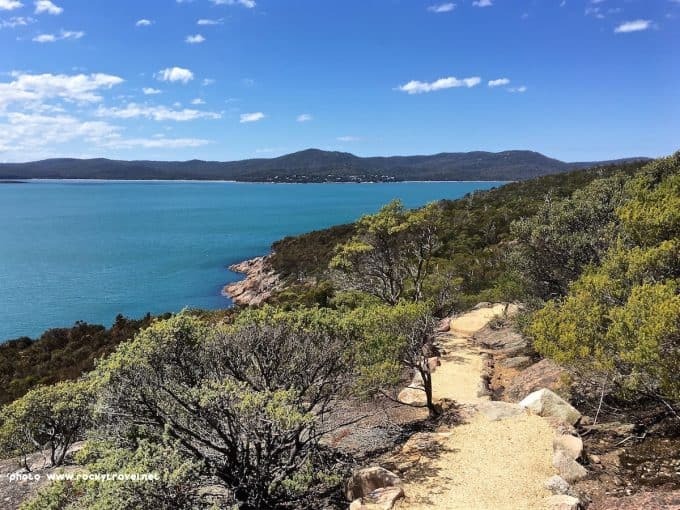 You need to do the first section to the Wineglass Bay lookout where you can admire the fabulous view of the Wineglass Bay; then you start the circular walk. What I like about this walk is the varied landscape, from red rock formations to the coastal path, skirting the beautiful coastline that offers breathtaking views over inlets and small bays. Halfway you can stop at Hazards Beach for a break to then continue through the harsh bushland and orange painted rocks for about 7 km. There are many lookouts along the way for taking pictures and also savouring the environment. Make sure to bring plenty of water with you as there are no fountains on this path. This is one of the most rewarding and comfortable day-walks for everyone who likes to go it alone, but also if you plan it in as a day hike in a small group. Mount Kosciuszko isn’t just Australia’s highest mountain, it’s a ‘Seven Summits’ peak (world’s lowest!) with a swag of (five and counting) Australian exclusives. That’s a ‘three for the price of one’ deal on an embarrassingly easy 13 km (eight miles) hike to the 2228 metre (7313 ft) summit. The 600 metre (1982 ft) elevation change from ski resort town Thredbo to the trailhead is apparently the most difficult. But happily the Kosciuszko Express chairlift made short work of it, depositing me and my climbing buddy above the tree line onto the raised metal walkway, purpose-built to protect the delicate Alpine environment beneath. Only 6.5 km (4 miles) to the top from here, with a total elevation change of only 300 metres (991 ft)! First up is Lake Cootapatamba, highest in Australia, and maybe hardest to pronounce! Then there’s Rawson Pass, home of Australia’s highest public toilet and/or emergency bunker if a stray blizzard blows in. Is Mt K is the only Seven Summits peak with its country’s highest loo clearly visible in the view from the top AND country’s highest peak visible from the loo? Just below is Charlotte Pass, Australia’s highest permanent settlement where Australia’s lowest ever temperature of -23° C was recorded. It’s only a kilometre and 128 metres of elevation from here to the summit where we enjoyed the 360° view across Main Range, Monaro Tablelands and the Victorian High Country while awaiting our turn for a ‘proof’ shot at the summit cairn. Chances are good that I won’t be bagging any more Seven Summits Peaks. But at least I can hold my head high when confronted with REAL mountaineers and truthfully say that I’ve made a start. And that makes climbing Mt Kosciuszko SO worth it! The Pinnacle is located in Halls Gap, in the Grampians region of Victoria. You can see ‘The Pinnacle’ itself from in town, it is one of the rocky outcrops when you look up! There are a couple of different ways to hike up to The Pinnacle. You can make a full day of the hike and walk from town or there are two other starting points further up the mountain. The couple of times we have done this walk we have always left from the Wonderland Carpark, which is about a 10-minute drive from Halls Gap. The car park is tiny and unless you are there first thing you’ll be forced to park back along the road. There are toilets available at the car park. Once you start the hike you will soon come to the ‘Grand Canyon’. This is the part of the walk which we love the best; with tight spaces, ladders, rock jumping, and rock scrambling. The walk continues up through Silent Street before continuing to rise up to the top of The Pinnacle. From here the hike changes from bushland to open rocky outcrops. This walk is rated as a little more challenging due to all of these factors but I really think most people if they take it slow should make it just fine. It is very exposed to the elements at the top of The Pinnacle. We have been in summer with wonderful views across the valley and we have also been in winter with bone-chilling wind and lots of cloud cover. You return to the car park via the same track but you can veer off once you get to the top of the Grand Canyon. The Grand Canyon is not a one-way track (going up) but as there are many steps, rocks and tight squeezes it doesn’t leave much room for passing and is, therefore, best to continue down the alternative track. 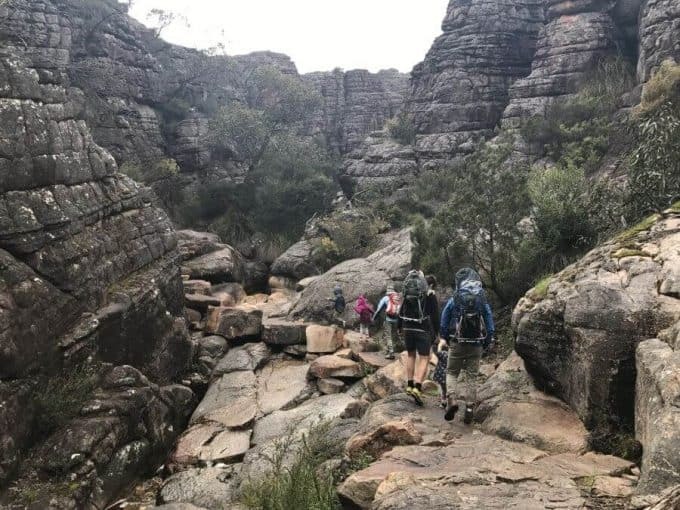 This is one of our favourite hikes and one we are happy to do each time we visit The Grampians. One of the best day hikes hands down has to be the Cape to Cape track in the South West region of Australia. What makes this track so fantastic, is that there are some many starting points you can really customize the length of your hike so easily. The entire length of the trail is around 130 kms and most people take 5 to 7 days to complete the entire trail from start to finish! Overall the Cape to Cape Track difficulty is easy to moderate. Some parts may be a bit challenging as there are numerous steps in some sections or long periods walking on soft sand. My favourite part of this track for a good day hike is from Yallingup Beach car park to Moses Rock Road car park. This part of the Cape to Cape track is about 17 kms in total and can take anywhere from 4 to 6 hours depending on how much you stop. There are plenty of little cliff side nooks to throw down a blanket and have lunch with a view. It is also a good opportunity to spot some whales if you are doing the track during peak whale season. 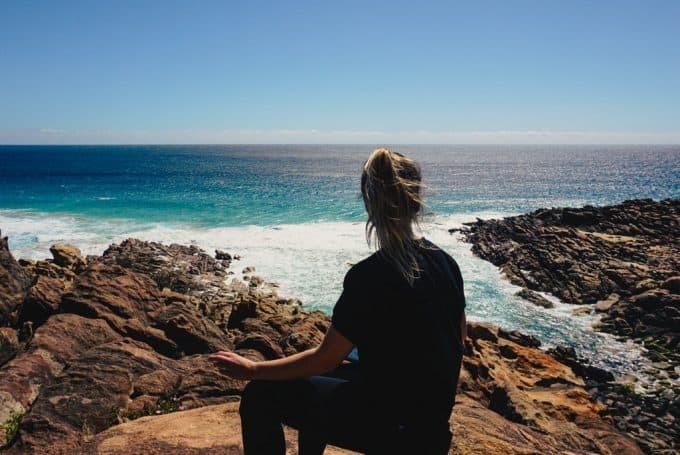 In this section of The Cape to Cape track, you will cross the sandy Smiths beach, trek through Cape Naturaliste National Park and see some amazing cliffside views. If you want to extend your hike and take some small worthwhile detours, you can certainly do that and is highly recommend. Check out, Canal Rocks, Quinniup Falls, Injidup Natual Spa. This track is so special and unique, every few kilometres you are seeing different terrain. If you are in the area, definitely take the time to chip away at the 130 km of the Cape to Cape track and see as much as you can! 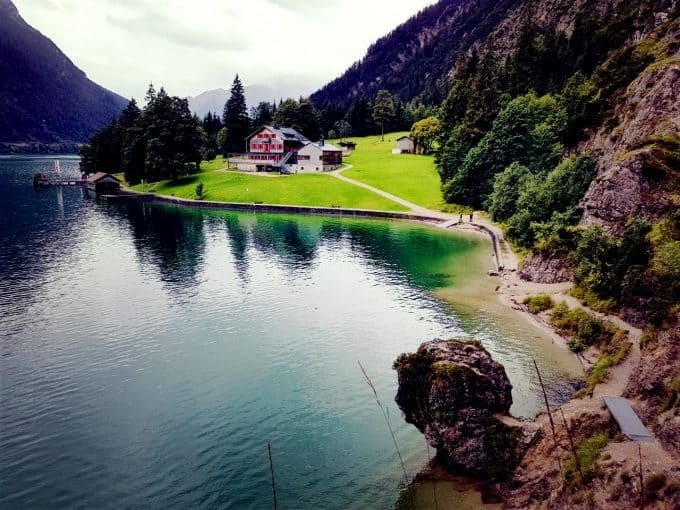 An Alpine lake, an easy hiking trail, and a traditional mountain hut restaurant – what more can one ask for of a day hike? The Pertisau to Gaisalm hike on the shores of Lake Achen in the Austrian Tyrol has all of that and more. Because if you’ve had too many beers at the mountain hut, you can also take a boat back to Pertisau! Lake Achen is the largest Alpine lake in Tyrol and an undiscovered nature paradise outside of Europe. The hike to the Gaisalm from the holiday village of Pertisau is just over 4 km long. At first, hikers are very close to the lake on a wide gravel path. Then it winds its way up a little bit and you end up next to a rock face with the beautiful colours of the water below you. Finally, you enter a forest before the Gaisalm miraculously appears. The Gaisalm is the only traditional mountain hut in Austria that can be reached by boat. There is a docking station for the Lake Achen ferry. However, if you want to extend your hike you can either walk back to Pertisau or continue another 4 km or so to the next lakeside village of Achenkirch. From here, you can also catch a boat back to Pertisau. You don’t have to be super fit to complete this hike. However, sure-footedness and a good head for heights are recommended for the rocky parts. Bulgaria is one of Europe’s most beautiful countries. This Balkan country is one you can’t miss if you love nature, and ever since the moment we booked our trip, we knew a hike to the mountains had to be part of our Bulgaria itinerary. The country is home to the region’s highest mountains, the Rila mountains, which are located in southwestern Bulgaria, just a couple of hours away from the capital city of Sofia. As we were only in the country for a few days and were completely dependent on public transportation (exploring nature sights is much easier if you are able to rent a car), we decided to visit these mountains as a day trip. 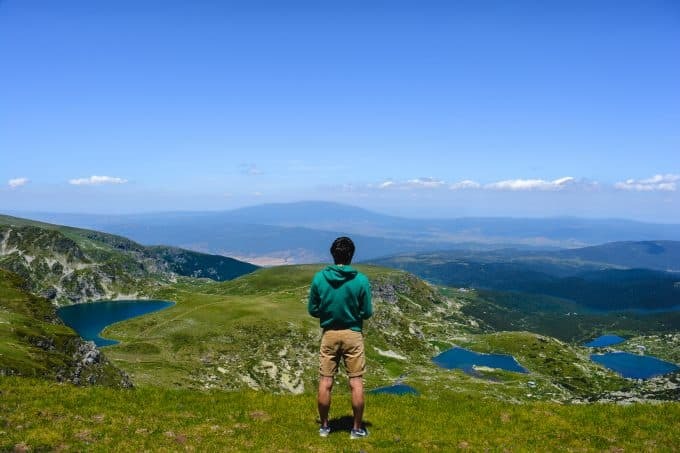 We hiked to see the Seven Rila Lakes, the region’s most famous glacial lakes, and the perfect choice for inexperienced hikers who still want a little bit of adventure. There are different levels of difficulty, and clear indications along the way to make it suitable for every type of hiker. As we were short on time, we made use of the cable car at the start of the trek. The hike took us around 6 hours, but you can do it faster if you don’t want to stop and appreciate the stunning landscapes as much as we did. Banff National Park is one of the most visited places in Canada and also one of the most stunning ones. 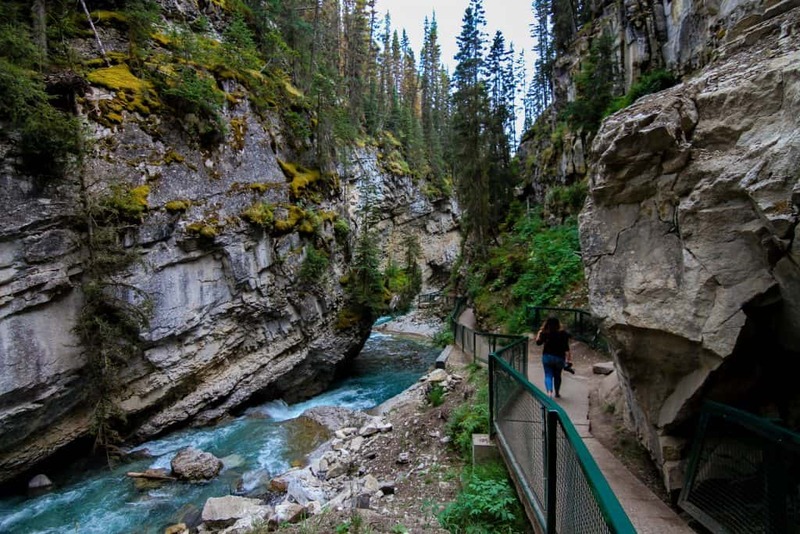 There’s plenty to see and do in Banff but one of the most popular things to do is to hike the Johnston Canyon which you can find along the Bow Valley Parkway. Whether you’re hiking it in the summer or winter, the sights, canyons, and waterfalls look worlds apart, so it’s always worth coming back to. From the entrance and a short cross of a bridge, you will first hike through the canyons themselves. The trail is easy to moderate and you will get to the first waterfall within a reasonable time (it’s about 1 km from the entrance), so you will feel the gratifying return almost immediately. You can’t miss it at the fork, this would be the Lower Falls. You will get to see it whole at the ensuing bridge, but cross the bridge and into a small nook (lineup permitting) and you will get to see the bottom of the falls and hear the acoustics it resonates inside the nook. If you don’t have a lot of time, ending your hike here and turning around is perfectly fine but, if you want to see a grander view, take the other way at the fork and you’ll get to the Upper Falls. This falls is particularly blue and beautiful in the winter as it is frozen over and likely to have ice climbers already scaling up and down it. The Upper Falls are about 2.7 km from the entrance. If you’re up for even more a challenge head to the Inkpots which is a total distance of 5.7 km from the entrance. Most people turn around at the Upper Falls which is usually about a 2-3 hour round trip! Banff National Park is one of the best places to hike in the world. It features sky-high granite peaks, turquoise coloured-lakes, and most splendidly, beautiful larch trees that turn golden in the fall. 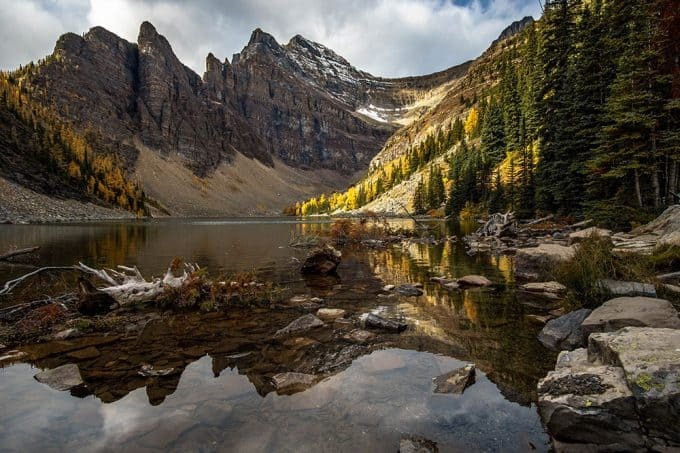 While it is almost impossible to choose which is the best place to see golden larches in the Canadian Rockies, the hike to the Lake Agnes tea house is easily one of Banff’s finest. The popular hike begins at the world-renowned, gem-hued Lake Louise and winds for 3.5kms/2.2 miles through switchbacks up to Lake Agnes at 2135m/7005 feet. Once at Lake Agnes, visitors can enjoy a packed lunch with views of the lake, golden larches, and surrounding peaks. Or they can have “high tea” in the historic Lake Agnes Tea House provided that they arrive before it closes in early October. Hikers who are short on time can then return the way they came. 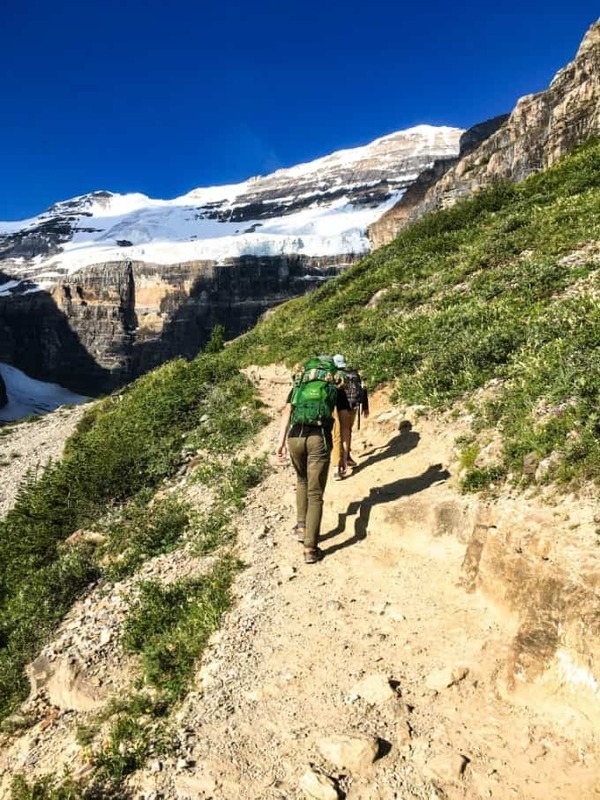 For those looking for more of a challenging day hike, can continue onto the Plain of Six Glaciers Tea House making a 10.8km/6.7 mile circuit with sweeping glacier views, chances to see majestic mountain goats, and a glimpse of Canada’s highest habitable structures, the Abbot Pass Hut. Doing so will also allow visitors to see more of Canada’s oldest and most beautiful national park. 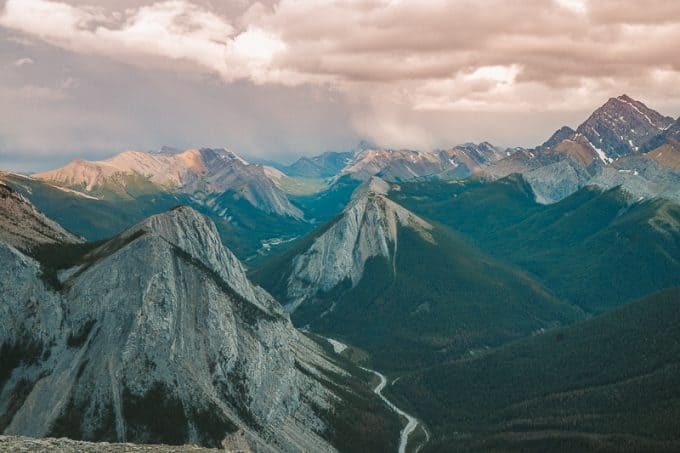 One of the best hikes I have experienced is the Sulphur Skyline hike in Jasper National Park located in Alberta, Canada. Jasper National Park consists of five different areas. The Sulphur Skyline trail lies in the Miette Springs area and consists of 8.8 km round trip, hike with an elevation gain of 649 meters. It will take about 4-6 hours to complete and labeled as a strenuous hike. To get to the trail, you can easily find parking in the Miette Hot Springs Parking lot. The hike starts as an uphill climb up a paved path. Don’t be deceived, the trail eventually becomes unpaved, and the decent becomes pretty grueling. Soon enough, you will run into some tough switchbacks leading up the mountain. The grade is steep all the way to the peak, but the views of The Fiddle Valley, Utopia Mountain, and Ashlar Ridge are worth all the pain. The 360-views at the top of all the surrounding mountains are entirely out of this world. You might even get lucky and spot some mountain goat frolicking around the mountains. Once you are done taking a million pictures of the stunning views, head back down and stop at the Miette Hot Springs located next to the trailhead. Your muscles will be very thankful! *Check out her post on Jasper attractions for even more things to do. 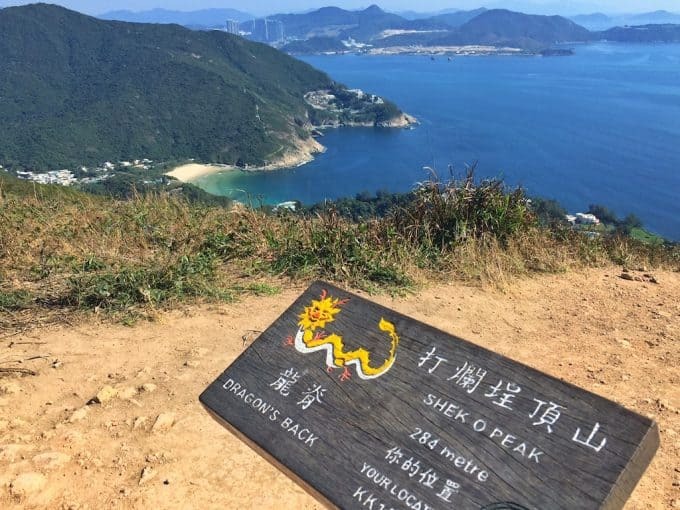 The Dragon’s Back is the most famous hike in Hong Kong and is definitely worth checking out if you are visiting the city. It is a relatively easy hike with fabulous views – and it ends on a beach. What more could you ask for? The Dragon’s Back is the final section of the longer Hong Kong Trail, a 50km trail that traverses Hong Kong Island. If you only have time to fit in one section of the trail, then make it the Dragon’s Back. After the initial ascent of around 200m, it is an easy ramble along the undulating spinal ridge of the mountain, which gives the ‘Dragon’s Back’ its name. The hike is renowned for its amazing views – over beaches and out to sea on one side, and over the mountains to the other. If you think that Hong Kong is just about skyscrapers, this will soon have you thinking again! The highest point of the trail is Shek O Peak at 284metres, and from here you have views in all directions. The trail finishes on the beach in Big Wave Bay, where there is a café and you can rehydrate to the sound of the crashing waves. 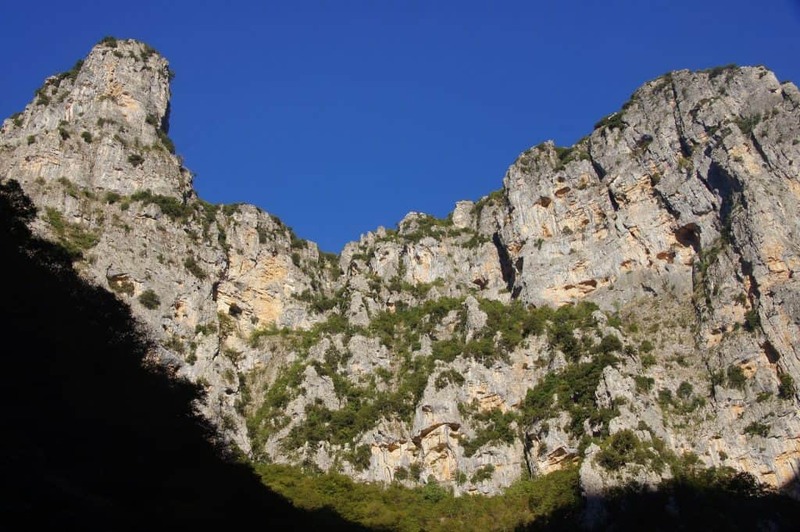 The Vikos Gorge is a fantastic location for a day hike in the Zagorohoria region of northwestern Greece. As you walk through the gorge, you will be surrounded on all sides by spectacular scenery. According to the Guinness Book of World Records, Vikos is the world’s deepest gorge, and walking inside it is a humbling and awe-inspiring experience. Whereas the more famous Samaria Gorge on the island of Crete receives upwards of 3,000 visitors per day in the high season, Vikos Gorge is largely unknown among tourists. This means you’ll be able to enjoy the scenery in peace and quiet and experience authentic life in a small Greek village. The terrain is a bit rocky inside the gorge, but once you’re inside it’s mostly flat and not especially difficult. The hike starts in a small mountain village called Monodendri. You can catch a bus to the village, but be sure the driver knows where you want to be let off! While English is widely spoken in Greek cities, the same cannot be said for rural areas, so communication breakdowns do sometimes happen. It’s also a good idea to bring some hiking snacks with you, because Monodendri doesn’t have much in the way of supplies. You’ll be able to get a hot meal there the night before your hike, but it’s not a good place for stocking up. The hike takes about six to seven hours and ends in the picture-perfect village of Mikro Papingo, which is basically a small cluster of houses with stone walls and slate roofs perched on the side of a mountain. I love adding adventure to my itinerary. And when I went to Guatemala, it was no different. Initially, I was going to climb Acatenango volcano, but due to catching the flu on the plane and my body getting weak, I had to change my plans and do a half a day hike to Pacaya Volcano. Located two hours away from Antigua, Pacaya is one of the active volcanos of Guatemala. After the eruption in 2014, the path to the crater has been closed. However, you can still climb to the caldera created by the lava rivers over the years. On some days, you can even see lava on top of Pacaya’s crater. I was lucky and saw some, which was quite spectacular, as it was my first time seeing lava before. 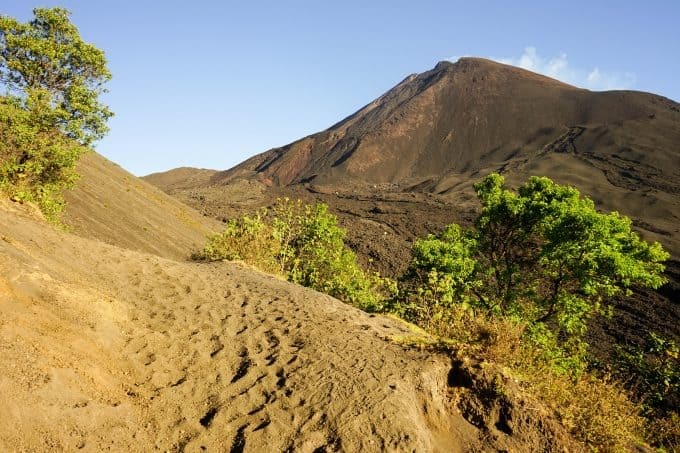 The hike up to Pacaya is quite difficult because it is steep and on volcanic soil. However, it doesn’t take long. In one hour you can be at the start of the caldera. If you feel that the hike is too difficult, you can rent a horse for the equivalent of around £10. Once my group reached the caldera, the guide took us to a place where there was a hole in the ground. Then he took out a bag of marshmallows and distributed them among us, together with some sticks. Yes, on Pacaya Volcano you can roast marshmallows using the heat that comes from deep inside! On the way back we climbed another volcanic sand wall of the caldera, to see the sunset over the valley below us. It was spectacular! The best day hike I’ve ever done is without a doubt in Bali, hiking the active volcano, Mount Batur. Firstly, how many people get to say they’ve hiked a live volcano, where you could literally see the steam and feel the heat?! 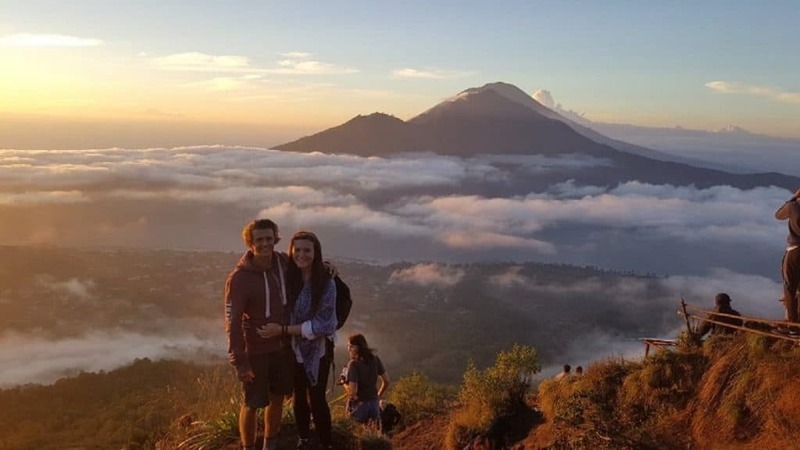 This is a hike that starts very early, at 3 am, because you want to catch the most epic sunrise over nearby volcanoes Mount Agung and Mount Agang. It’s totally worth the early start. The hike itself takes around 2 hours (slightly more if you are stopping for more rest breaks…which you probably will!) It’s a height of 1,717 meters, or 5,633 feet above sea level, and I would class this as a “moderately difficult” hike. If you are super super fit, then you might find it easy, but if you are of normal fitness, then it may feel tough! Once you reach the top it’s worth it for the amazing views. When you go with a guide, they will have brought a light breakfast that you can enjoy with the stunning views that surround you. Whether you’re travelling solo, with a group of friends, or as a couple, this is a perfect day hike. After your early start, you can relax by the beaches of Bali for the rest of the day! 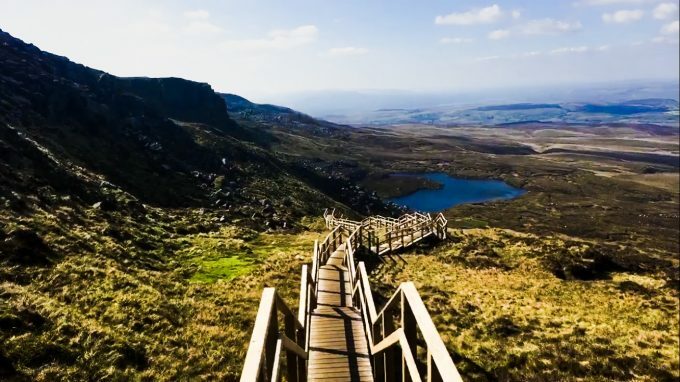 One of the best day hikes I have ever been on would have to be Cuilcagh Mountain located in County Fermanagh, Northern Ireland. The Mountain is home to a rare blanket bog. In 2015 a boardwalk was built to protect the bog from being damaged by walkers. The hike was made famous on social media back in 2017 and was informally renamed Ireland’s Stairway to Heaven by locals. I began hiking the trail at the Legnabrocky Car Park. The hike begins with a 5.8km gravel path, along this path I saw some beautiful wildlife, a stunning river and Cuilcagh Mountain before me. I then continued towards the boardwalk, the boardwalk continues for a further 1.6km and ascends into a stairway reaching for the sky, or heaven as the name suggests. The walk consists of 450 steps. I will admit, it is a hard workout, but totally worth it for the stunning view at the top. The summit of the Mountain offers amazing views of County Fermanagh and makes you feel as if you are ‘on top of the world’. It took me a total of 2 hours to reach the summit, I rewarded myself with small bite to eat in front of the phenomenal view. It then took a further 2 hours to descend down the mountain. Those hoping to partake in this hike should have a moderate level of fitness as it can get steep in places. This Hike is one of my favourite hikes in Ireland due to the pure uniqueness of the trail, the sense of accomplishment upon completion and the scenic beauty throughout the walk. It is 100% one for the bucket list. There are several reasons that this is my favorite day hike. 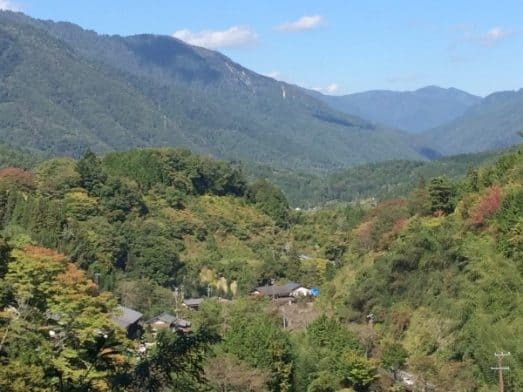 First of all the hike takes you through the foothills of the Japanese Alps and affords great scenery without a huge expend of effort. Secondly, as you hike between two of the ancient post towns on the historic Nakasendo Trail there is a baggage transfer service, so you can hike easily without having the hassle of taking all your bags with you! Thirdly, there are some great cultural experiences en-route – a superb tea house with the friendliest of people to spend time with. The well-formed path winds through woodlands and tails for 5 miles (8 kilometers) and connects the two renovated post towns of Magome and Tsumago. Elevation changes are gentle and you’ll find shade too. The trail is well sign-posted and there are places to eat and stay in both towns as well as helpful tourist information staff to help you on your way. One of the most memorable day hikes we’ve ever been on is Tongariro Alpine Crossing in New Zealand. It’s a full day hike with the total length of 19.4 km. 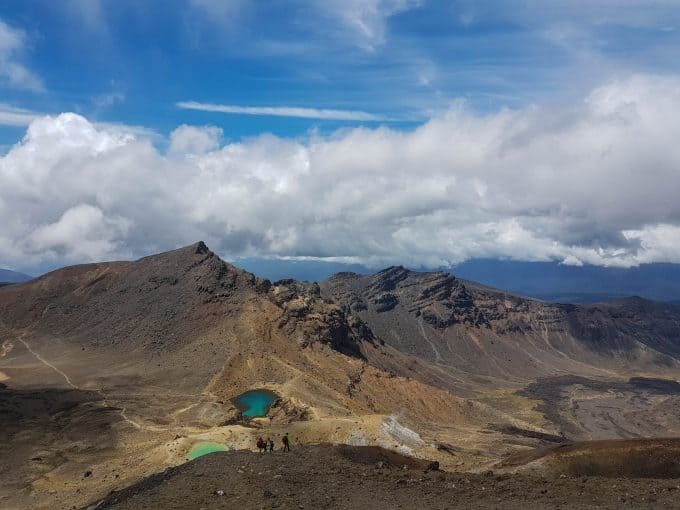 Tongariro Crossing is not the easiest day hike, but it certainly is accessible for people with various fitness levels. The trek starts at the altitude of 1120 m, going to the highest point of 1886 m and down to 760 m, so you have to be prepared to do a lot of uphills and downhills. It would not be advisable for those who can’t handle walking long distances, but amateur hikers and people with moderate fitness levels should not find it too difficult. The crossing lies in the North Island and it takes you through a variety of landscapes. This hike starts in the Mangatepopo Valley, goes over an active volcano Mount Tongariro and brings you down to the Ketetahi car park. On your way, you will also pass Mount Ngauruhoe, the famous Mount Doom from Lord of the Rings. The scenery is absolutely stunning: you’ll get to look into a Red Crater of a volcano, enjoy the view to the colorful Emerald lakes, pass waterfalls and look over seemingly endless fields. If rapidly changing weather, the popularity of the trail and risk of volcanic activity doesn’t stop you, it might become one of your best experiences on the North Island. Take your time, bring snacks and plenty of water and enjoy this amazing trail through one of the World Heritage Sites. Visiting Scandinavia for the first time in 2014, I decided to do three of the best hikes in Norway in only three days. 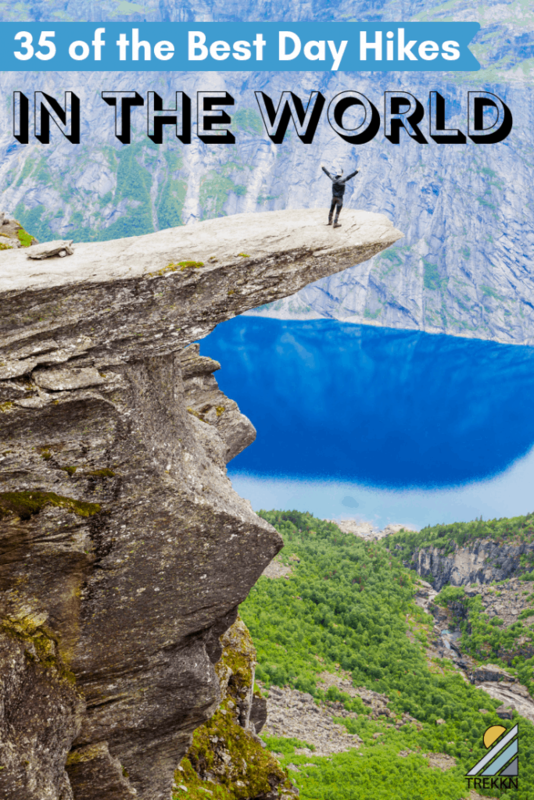 After doing the Kjerag and Preikestolen hikes I headed to Odda to do one of the most famous hikes in the country, Trolltunga. Trolltunga (Troll’s toungue) is located east of the Skjeggedal area, about 10km (6.2 mi) east of the village of Tyssedal and Sørfjorden and 1250m above sea level. The hike is 22Km longer (11km each way), takes around 8h (4h each way) and the terrain varies from muddy, to rocky, icy and snowy. The best time to do this long and difficult hike is during the summer, from mid-June to the middle of September. 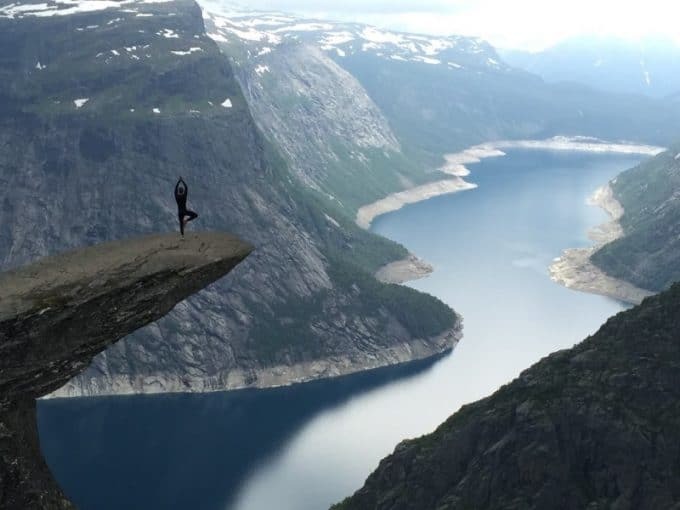 And what makes Trolltunga the best hike in Norway apart from being one of the most Instagrammable places in the world is that during the whole hike you pass by many waterfalls and stream waters and are surrounded by some of the most magnificent scenic cliffs in the country. Once I reached the summit and was on the top of Troll’s tongue, I was completely speechless. The view of the Norwegian fjords with the snowcapped mountains and the dark blue underneath me was spectacular and unparalleled. Trolltunga is something beyond magical and breathtaking. It’s a place that it’s hard to believe that exits. I would definitely do this hike again because it was the best day hike that I’ve ever done. Hiking the Inca Trail to Machu Picchu is the best hike I’ve ever been on. The trail stats near the city of Cusco, Peru and culminates in the ancient Inca ruin sites of Machu Picchu. The hike is 42km in total and takes four days to complete. During the night you camp in tents at established sites along the trail. The Inca Trail is challenging especially because of the altitude. The trek starts at 2400m and reaches its highest point at 4200m so it is possible to experience altitude sickness. To avoid this take altitude sickness tablets, acclimatize in Cusco before starting the trek, and eat coco leaves to help with the symptoms. Preparing for the Inca trail by walking on a regular basis and building up stamina will make it a more enjoyable experience. What made the hike so memorable was the variety of changing landscapes along the way. 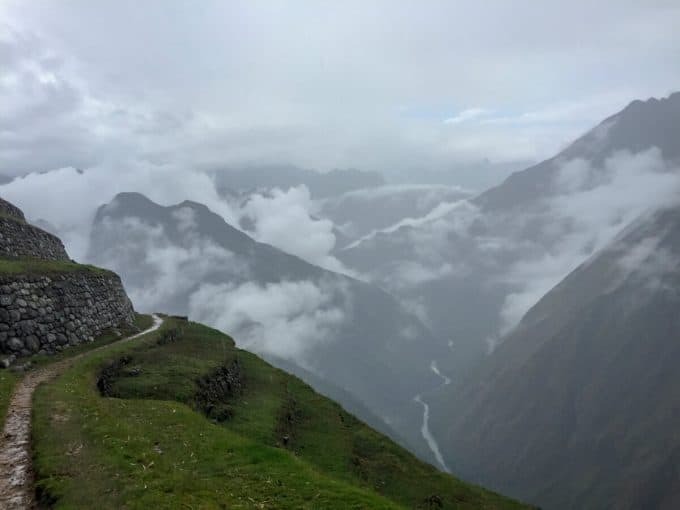 The trek takes you through ancient Inca ruins as well as breathtaking natural scenery; passing through snow-capped Andes Mountains, lush jungle, and mystical cloud forests. At the end of the hike, the ancient city of Machu Picchu appeared from beneath the clouds which was a moment I’ll never forget. I’ve been on my fair share of day hikes, but my favorite has definitely been Laguna 69—a stunning trek out of Huaraz, Peru. 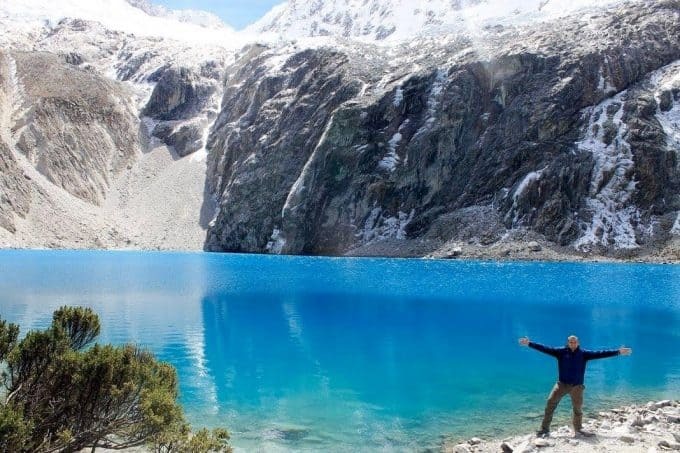 This trek can be done solo or through a tour agency in Huaraz. I’d recommend the group tour. Not only is it a safer way to travel, but it’s often cheaper as well. The hike lasts about 6 hours in total—3.5 hours up to the magical blue lake, a short time to enjoy it, then another 2 hours back down. As far as difficulty goes, it wouldn’t be so hard if it weren’t for the altitude (15,000 ft). Hiking at altitude is a weird thing. I literally saw a world-class athlete, hands-on-knees, huffing and puffing—while a porky couch potato blew right past him. Altitude affects everyone differently. To make sure you’re prepared, it’s best to leave yourself a few days beforehand to give your body time to acclimatize. Also, make sure to stock up on coca leaves to chew on before heading out. Some say it helps, some say it doesn’t. For me, it worked wonders. During the hike, go at a pace that’s comfortable for you. Now’s not the time to race or push yourself. It doesn’t matter if you’re the last in your group to arrive. If you push too hard, you’ll have a miserable headache at the top (or worse). That said, the faster you arrive, the more time you’ll have at the prized lake. So if you’re feeling good, don’t waste time taking pictures on the hike up. Get to the top, enjoy the lake, then take the rest of your pictures on the way down. If you’re in Peru, don’t miss Laguna 69. It’s a site you will never forget. 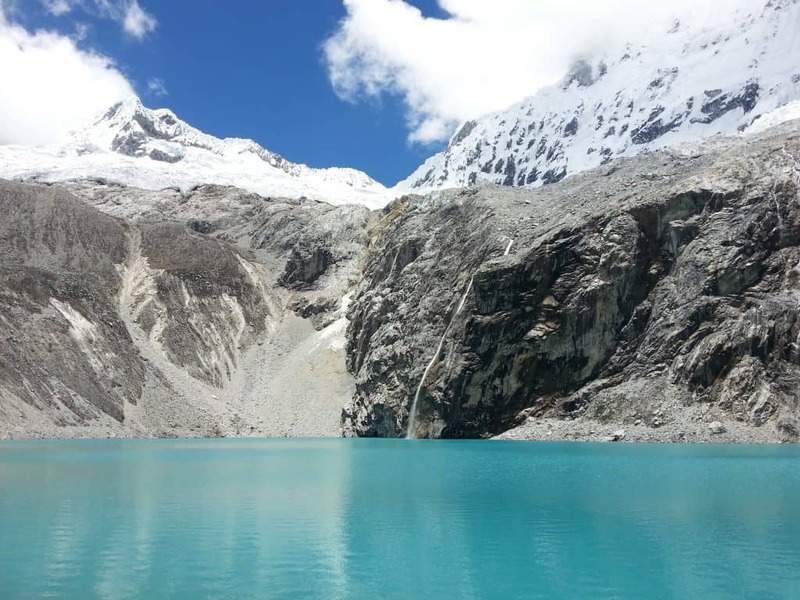 The Laguna 69 trek in Huaraz Peru is a beautiful but challenging hike, high in the Sierra Nevada mountain range. Most people choose to join a tour group to hike to Laguna 69, as public transport isn’t the most reliable here. Leaving early from Huaraz in a mini-bus we drove for a couple of hours to reach the beginning of the hiking trail, passing through the UNESCO listed Huascaran National Park, where we spotted some vicuña (a rarer relative of the llama). The trail to Laguna 69 isn’t particularly difficult, starting fairly flat to cross the plains to the mountain where the lake is found. However, the trail begins at 3900m above sea level, increasing to a breath-taking 4600m. If you are not fully acclimatized to the altitude before beginning the hike you probably won’t be able to make it to the lake, as the air is just too thin. However, if you do make it, you will be rewarded with a beautiful turquoise lake, with water from the mountain glaciers. On a sunny day you may want to take a dip, but of course, the water is very cold! I actually did this hike while I was recovering from a bout of food poisoning which I really wouldn’t recommend, but it really was worth the effort! 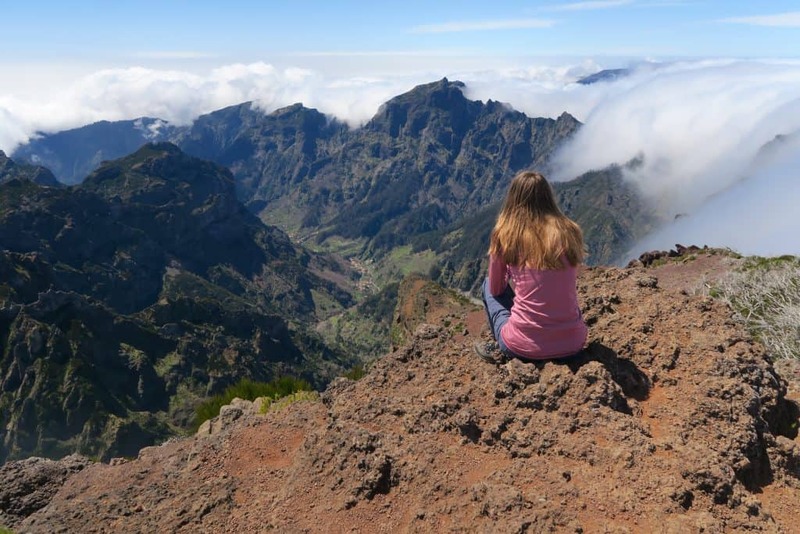 There are several hiking trails in Madeira, but one of the most scenic one is Vereda do Areeiro – Pico Ruivo. It connects the two highest points of the island Pico Areeiro and Pico Ruivo. This 14 km round trip hike can take 6-8 hours. The terrain can be quite demanding, so it is only recommended for experienced hikers. There are many steep sections and the path often goes right next to the cliff edge, so people with vertigo should choose a different hike. Make sure you bring water, food, and torch with you, as you will have to go through some dark tunnels along the way. Waterproof jacket and sun cream are also highly recommended as the weather conditions can change quickly in the mountains. This hike has gorgeous views. It is an amazing feeling to walk above the clouds. You could even plan to come and see the sunrise here. It is possible to visit both peaks without hiking, as there is a parking lot at both places not far from the top. So if hiking is not your thing, you can just come up for the views. It is also possible to just hike one way, and if you get too tired, you could call a taxi, to take you back to your car. One of the best hikes I did in my life and I’ll never forget about was a via ferrata hike in Slovenia to a mountain called Prisojnik (2547 m). In Slovenia, every mountain has several different paths up – from very easy ones to very difficult ones. 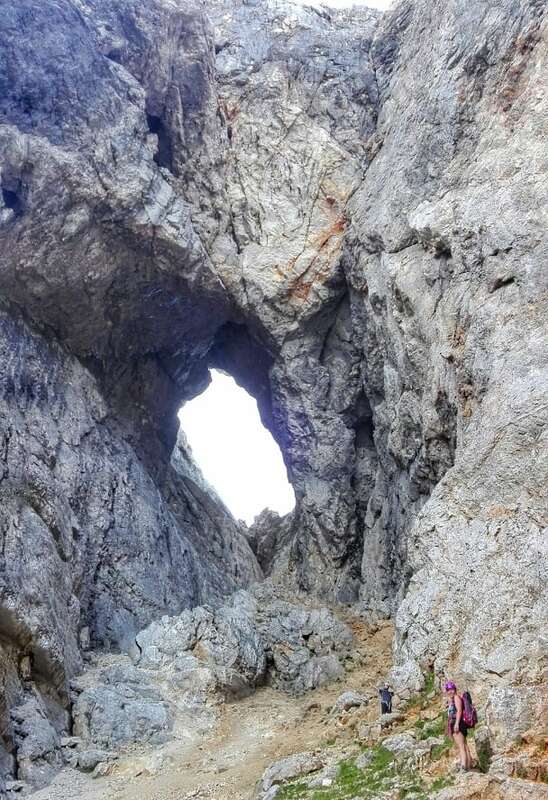 This one was supposed to be an easy one, but accidentally ended up being a very difficult one – we missed the turning to the easy path and ended up climbing one of the most demanding ferratas in Slovenia (called Kopiscarjeva pot). As we were standing at the beginning of the climbing section, we asked a man who was dressing his son to a climbing security equipment, if we can manage this path without it – he literally said “If you can climb a tree, you can climb this mountain” and because we had free climbed several ferratas before, we bravely started. After passing some very difficult sections where we had to take of our backpacks and crawl on our stomachs pressed between two pieces of rock, and after climbing up the mountain window, we’ve reached the top with the most amazing views. Luckily for us, we found the easy path to go down and I must admit – if we took it up, it would be the most boring hike ever! The whole hike took 6 hours. Fun fact – the turning to the easy path was hidden behind the back of the man we were talking to – he literally covered the view at the markings with his own body. Read more hiking stories from Slovenia. When you think of hiking in Europe, Slovenia might be overlooked. Most people would head for the Austrian Alps and the Dolomites in Italy, but very few pay heed to the 321 lakes, day-hikes and multi-day treks in Slovenia. Not forgetting that Slovenia is the third most forested country in Europe and the top greenest country in the world. One such day hike that fits the bill as the most gorgeous and greenest day-hike in Slovenia is Krsnko Jezero. The lake is surrounded by colourful poppies, including several endangered species such as the yellow Kerner Alpine poppy. 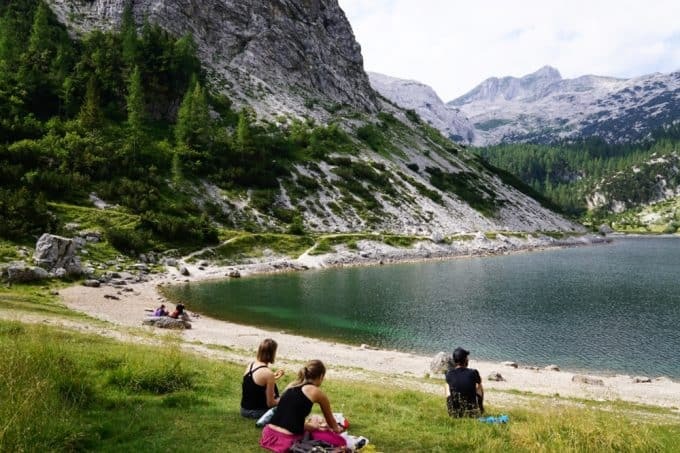 The 2-3 hour hike to Krnsko Jezero lake (1350m) in the Lepana Valley brings you to an open mountain on the green trails where you will see a beautiful emerald-green lake. No matter how often we saw the sights from higher ground, the stark contrast between the mountains and the green waters were a sight to behold. The iconic landmark of Table Mountain in the city of Cape Town, South Africa not only attracts visitors to the ride the cable car to the top but hikers to trek the summit as well. In fact, the Table Mountain National Park is huge and has a number of hikes that covers the expanse of the mountain range. We did the Constantia Nek hike via Eagles Nest and Camel’s Rock on the southeast side and it was one of the best day hikes we’ve done. It’s a moderate walk, 730m above sea level with an elevation gain of 530m. It’s a bit of a climb in certain places and we clambered up rocks that seem near vertical in places. 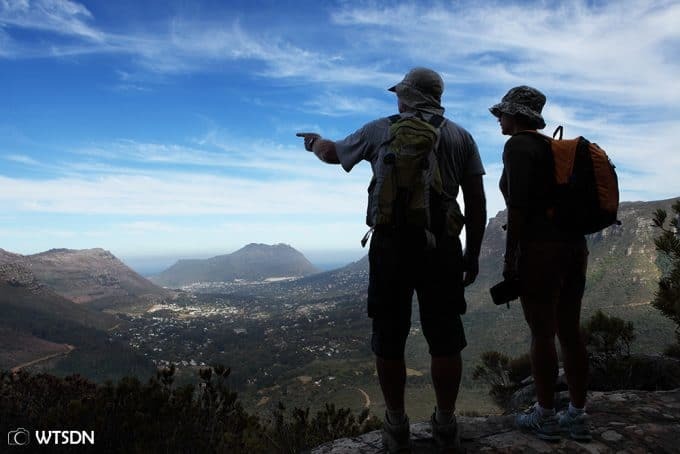 But, it gave us spectacular birds-eye views of the backside of Cape Town taking in vineyards, forests and we could see far afield as False Bay and Hout Bay. The plateau at the top is strewn with dinosaur shaped rock formations and the aptly named Camel Rock. There are also five reservoirs built over a century ago providing Cape Town with fresh water. The hike took us 6 hours in total, stopping off for umpteen photo ops, lunch and a scenic return journey via the Jeep Track and Cecilia Forest. Beautiful. The Cares River trail hike will make even the most experienced hikers a bit apprehensive. Although the trail is clearly marked, it traverses areas that can be a bit scary. 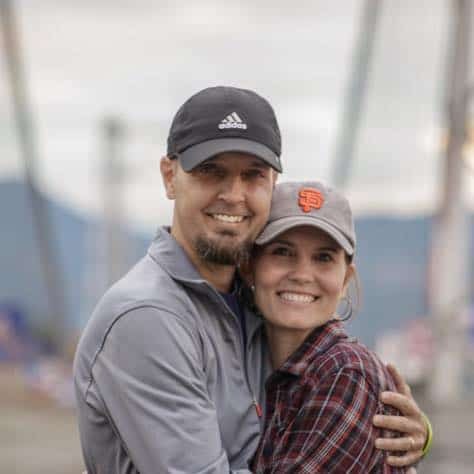 There are suspension bridges connecting mountains and stretching over gaping gorges filled with jagged rocks, and narrow trails precariously clinging to mountainsides. It’s all worth it. The scenery is breathtaking; soaring mountains, rushing streams tumbling into little lakes, and the occasional mountain goat. The route is a solid day hike crossing Spain’s lush, green Picos de Europa National Park. It spans the two Spanish provinces of Leon and Asturias connecting the towns of Posada de Valdeon and Poncebos. It is a good 18 kilometers but medium difficulty, so it can be enjoyed by most hikers and hiker wannabes. Some of the hike’s highlights are not even on the trail. 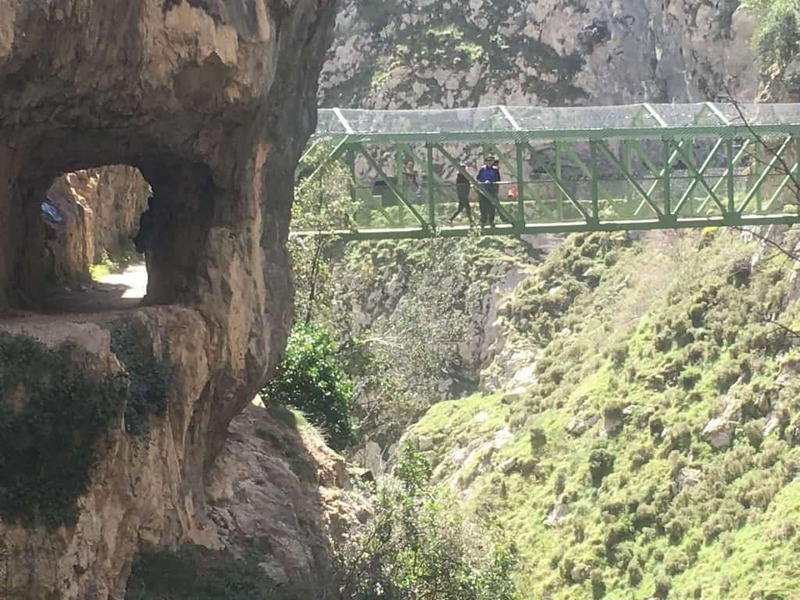 The preparation for the hike in one of the surrounding Spanish villages is a fun activity as the locals are accustomed to hikers and will help you bring the ideal gear and food. The exhilaration you feel after completing the hike is equally emotional. It’s party town in one of the villages on the other end of the hike. You can celebrate with one of the local dishes like fabada Asturiana (Asturian bean stew) and some of the local wine. One of my absolute favorite day hikes was last year when I hiked to the highest mountain top in mainland Spain, Mulhacen, 3479 meters. This is actually the highest mountain in western Europe except from the Alps. To make the hike on a day, you will have to take a bus from the nearby village Capileira up to the Mirador de Trivelez at an altitude of 2700 meters. This is a lot higher than you can drive with a private vehicle. The bus will drop you off and pick you up again 6 hours later. The hike in itself is not hard and doesn’t require a high level of hiking skills. However, the high altitude can be rough for some. I was struggling with my feet feeling extremely heavy and that made every step feel like a massive fight. However, the views along the trail is so breathtaking that there is always a reason to stop for a photo. Most likely you will also meet a few curious mountain goats staring at you along the way. Getting to the top of a mountain is always a satisfying feeling, and Mulhacen is no exception. The views are spectacular. As you have high mountains around you, you don’t get the feel of how high it actually is, but the mountain tops stretch as far as you can see. To hike Mulhacen on a day, you need to book your bus ticket in advance. The best time to go is in summer when the snow is gone. Though I am not an experienced hiker, and for the longest time, hiking was just a mean to enjoy great views. 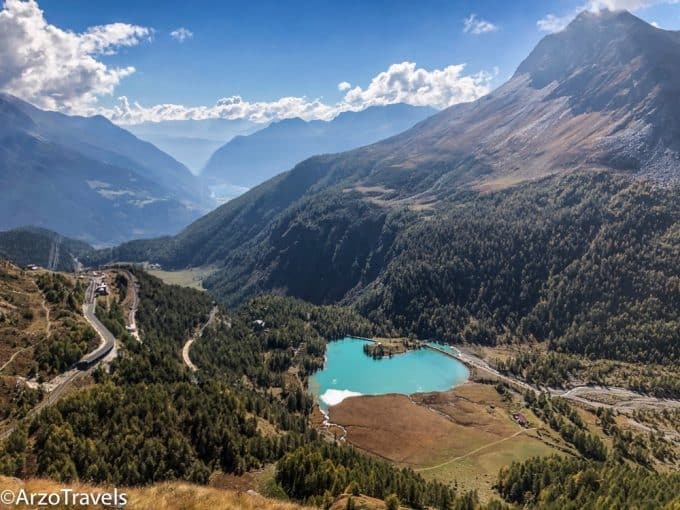 However, this changed when I started hiking in Switzerland – and while Switzerland offers a lot of amazing hikes, one of my most favorite and most memorable hikes was a hike in the area of Valposchiavo. Valposchiavo is located in one of the most eastern areas of Switzerland – in the canton of Graubunden – and an absolute hidden gem. There are some seriously amazing hikes but here is one of the best (that is also an easy hike). You can get via train to the highest train station in Europe (run by a regular train) – Ozpizio Bernina. Getting off that that train station will give you an idea of why this place is so fantastic. You can take the first break just here at the train station and Lake Bianco. However, from there you need do a 45 to 60-minute hike to Sassal Massone. The hike is easy, though it is uphill. Paths are well signed, but you could also use the free Graubünden Hiking App. Once up at Sassal Massone, you will have one of the most amazing views of the mountain ranges around, including the Palü Glacier and Lago Palü (Palü Lake). There are benches and on a clear day, this is pretty heaven-like. Do not rush – take your time to soak in the beauty before hiking down to Alp Grüm station (where you will also find a restaurant) and then to Palü Lake. If you want to keep hiking, don’t take the train from Ap Grüm but prepare yourself for another hike (downhill but steep at times) to Cavaglia Glacier Garden – this part is not so scenic but great if you want to spend more time hiking. Tip: Bring enough water – you will not find many streams or fountains with fresh water. Many visitors to the Grand Canyon, one of the most visited and beloved U.S. National Parks, simply admire the canyon from above, taking in the dazzling sights of the colorful striated walls of the massive gorge from afar. To best experience this marvel, however, you need to venture past the rim and hike into the canyon itself. Based on the canyon’s South Rim, the South Kaibab trail offers visitors a fantastic opportunity to wind down along its open ridgelines, which offer panoramic views of the park’s gorgeous rock formations. While this out-and-back trail is one of the most direct routes to the Bright Angel campground or Phantom Ranch, which house overnight backpackers on the canyon’s floor, taking the full length of the trail is a multi-day event- at least one to descend into the canyon and another to make the steep climb back. Luckily, visitors short on time don’t have to miss out on this experience- a number of viewpoints along the trail make for an excellent place to stop and drink in the incredible beauty towering above (and below!) you. Two of the most popular places to stop along South Kaibab are Ooh Aah Point, a two to four hour round trip hike that offers views that will, yes, make you ooh and aah, or Skeleton Point, a three to five hour roundtrip hike that will carry you some two thousand feet into the belly of the canyon. You’ll likely want to draw out your time at Ooh Aah or Skeleton Point- while their views are unquestionably stunning, nothing will quite take your breath away like that climb back up to the rim! 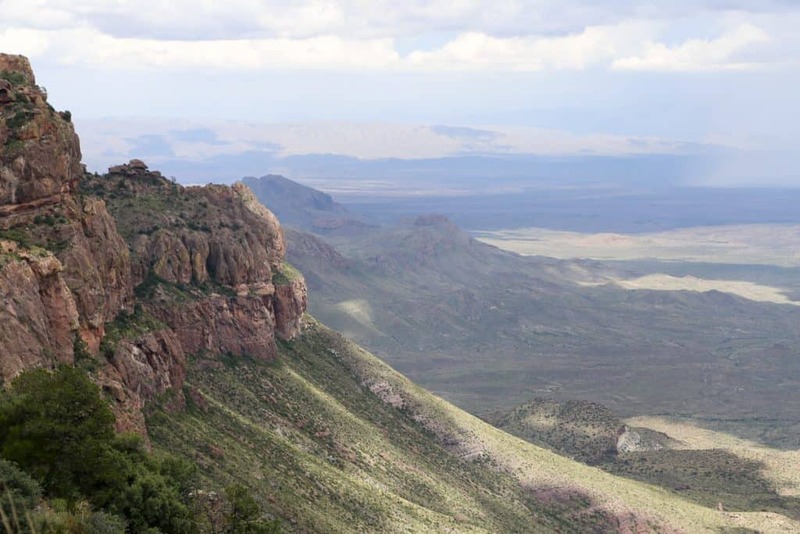 West Texas’ Big Bend National Park is one of the smallest national parks in the United States, but don’t be fooled, it’s home to 150 miles of stunning hiking trails. The park is divided into three geographic regions, each home to its own iconic hikes. While there are beautiful hikes in the desert and along the Rio Grande River, my favorite trail is the South Rim Trail in the Chisos Mountains. It’s a long loop trail at just under 13 miles and is classified as strenuous. The trail begins and ends in the Chisos Basin, starting out strong with switchbacks uphill leading to a picturesque view of the basin below. The trail isn’t technically challenging on a skill level. An amateur hiker can conquer the South Rim but you do need to be in strong athletic shape due to the sheer length. It takes an average of 7-8 hours to complete the entire loop. The highlight of the South Rim Hike is the reason for its name, the South Rim itself. The panoramic view from this cliff is the best in the entire park. Standing at the edge of the cliff you are looking down at Mexico below you. Save your picnic lunch to enjoy from this beautiful viewpoint and to rejuvenate yourself for the remainder of the hike. This is one of the best hikes in Big Bend and you won’t regret dedicating a day to the South Rim. 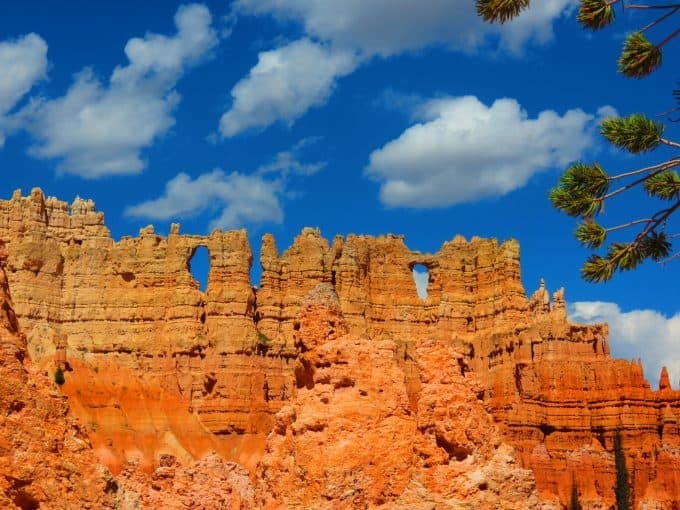 Peek-A-Boo Loop is a combination trail that highlights the best hoodoo views in Bryce Canyon National Park. Bryce Canyon one of Utah’s Mighty Five National Parks. This hike is a 5.5-mile lollipop loop. It has about 1,500 feet of elevation gain. The trail is a moderate hike with short bursts of steep ascents followed by matching descents. This loop starts at Bryce Point and descends into the canyon. This hike is best done in a clockwise direction. This allows you to descend while looking a section of hoodoos that haven’t quite eroded completely apart yet. From there, hikers pass through a series of tunnels into an area known as the Cathedral. At about the halfway point, you will reach a trail junction. You can either hike back to Bryce Point or if you want to add a mile to your hike, take the junction towards and head into the Queen’s Garden for even more hoodoo viewing. I have always loved the Peek-a-boo loop because it sees less foot traffic than the Navajo Loop or Queen’s Garden. The trail is about half as busy as the other two trails and gives hikes a chance to experience the Bryce hoodoos without a hundred new best friends. The only downside of this trail is that it is a shared-use trail. Mule tours are offered on this trail. Hiking is one of my favorite activities to do while traveling, and I’ve been lucky to experience some incredible treks around the world. While it’s hard to choose the best, one of my very favorite places to hike is in the United States’ Pacific Northwest, specifically Washington State. There’s no shortage of epic day hikes. but one of my favorites is the 7.7-mile out and back trek to Colchuck Lake. 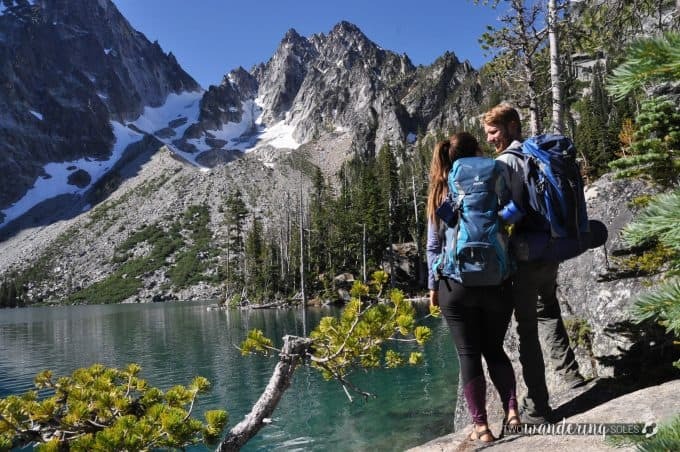 Set in the Cascade Mountain Range, a strenuous climb will reward you with an incredible alpine lake, glacier views, and giant rocks for lying in the sun. You might even want to brave the cold water and take a refreshing (and freezing!) dip. Don’t forget to pack your camera and lots of snacks. After a day of hiking, picnicking, and maybe even swimming, reward yourself with a hearty meal and local beer in the nearby town of Leavenworth! If you’re a real adventure seeker, you can continue trekking up Asgaard Pass into the Enchantment Wilderness Area, which is one of the most beautiful places on earth. However, this is extremely difficult to do in a day trip unless you’re very experienced with this area. And if you plan to stay overnight, you need to apply for a permit in a lottery-style drawing, as the Department of Conservation is trying to limit the number of overnight guests. One of my all-time favorite day hikes is Cascade Canyon in Grand Teton National Park, in the United States. The Grand Tetons are a mountain range that rise dramatically right out of the plains, with no foothills, and Cascade Canyon cuts through them. 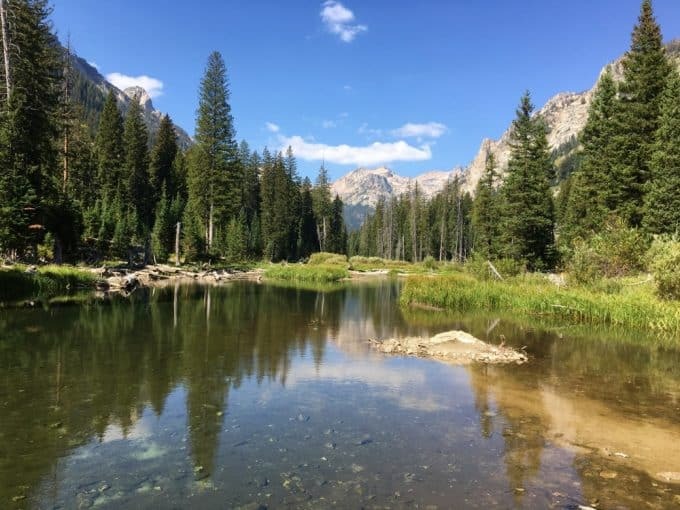 The trail for this out-and-back hike is reached from the Jenny Lake area of the park either by a 2-mile hike around the lake from the parking lot, or via a shuttle boat that crosses the lake. From the trailhead, it is a steep 1.5-mile hike up into the canyon. From there, the remaining 3 miles to the turnaround point are flat, mostly alongside a river. The scenery is stunning, with jagged snow-capped mountains rising high on both sides of the snaking river. Near the turnaround point is the waterfall that gives the canyon its name – along waterfall that cascades from a glacier at the top of craggy peaks all the way down into the river far below. This area is also great for wildlife viewing, and moose, otters and even bears are commonly sighted. Caution should be taken with bears (and moose). 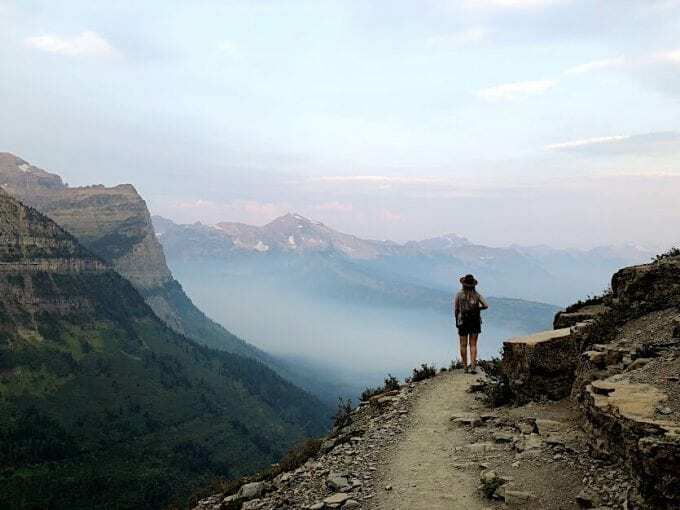 On the way back, a short spur takes you to Hidden Falls, a gushing waterfall, and Inspiration Point, for views over Jenny Lake and the valley beyond. This is a varied hike, moderately difficult (though most of the hike is flat) and the scenery is stunning. Did this give you a serious case of hiking and travel fever? I know it did for me! I can’t wait to start checking off some of these best hikes in the world one by one. Let us know which ones you’ve been on and which ones are on your bucket list. So many that I still want to do. Faaaaabulously inspiring collection of hikes and I’m not just saying that because one of mine is in there! More importantly, most of them look doable, even for a slow hiker like me 😀 Thanx for including my contribution – it’s been so much fun reading all the others!! Thank you for your contribution! And yes, so many amazing hikes and not just for the hard-core hiker.